Fabric Paper Thread: Blogging is so much Fun! Christi gave me this lovely award. She is a talented artist - her drawings are so detailed and full of emotion. She puts her heart into what she does. Her blog is Charm and Grace Cottage - isn't that a beautiful name? I'm really short of time right now and am not going to follow through with linking to 7 other blogs the way I'm supposed to. What's keeping me so busy are my studies - wow, all the reading! History, Geography, French and English - the material is all so interesting, but really time intensive. I'm loving it. 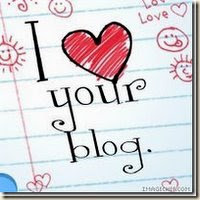 Blogging is my way of taking mini-vacations. I've met so many wonderful people through blogging. Someday, I'd like to meet you all in person! Congratulations on your award. You deserve it! Congratulations on your award Lorrie!